Arthritis of the shoulder most commonly refers to osteoarthritis, or “wear & tear” arthritis. This is often a gradual process in which the normal cartilage covering on the ball (humeral head) and socket (glenoid) of the shoulder joint is worn away. This can lead to uncovering of the underlying bone and a stiff, painful, shoulder joint. Less common forms of arthritis affecting the shoulder may be due to inflammation, i.e. rheumatoid arthritis, or secondary to a long-standing massive rotator cuff tendon tear. Although less common than in the hip or knee, arthritis of the shoulder can be equally debilitating. Commonly it causes a constant deep-seated aching discomfort around the front and back of armpit that is exacerbated by movements of the shoulder and often disturbs any attempts to sleep. Significant restriction of movement of the shoulder is usually also seen; making previously simple day-to-day tasks such as washing one’s hair difficult or impossible. 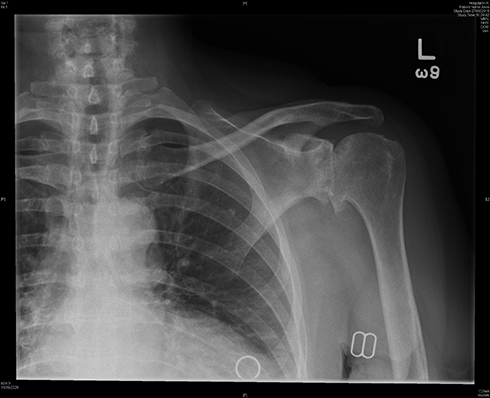 The diagnosis of shoulder arthritis will usually be made based on a “narrowed joint space” on two X-ray views, in conjunction with the clinical history and examination findings. Sometimes a CT scan will be recommended to determine the bone present of the socket side of the joint to aid pre-operative planning by the surgeon. An MRI or ultrasound scan may be obtained to provide an accurate assessment of the integrity of the rotator cuff tendons within the shoulder to determine the most appropriate design of shoulder replacement to use. Non-surgical Oral pain relief medication, in combination with modification of daily activities, may help to alleviate some of the symptoms of shoulder arthritis. A local anaesthetic and corticosteroid injection into the shoulder joint may settle some of the inflammation secondary to the arthritis, and provide some temporary pain relief. In patients with early arthritis, an alternative injection of hyaluronic acid, e.g. synvisc, may be recommended. Surgical If the above measures fail to provide an acceptable level of improvement in symptoms then surgical intervention can be considered. In younger patients with evidence of earlier degenerative changes within the shoulder joint, a key-hole operation to washout the joint, remove any excess bone that may have formed (osteophytes) and release the tight capsule of the shoulder can provide good pain relief. In more established cases of shoulder arthritis, we will most likely recommend a total shoulder replacement. 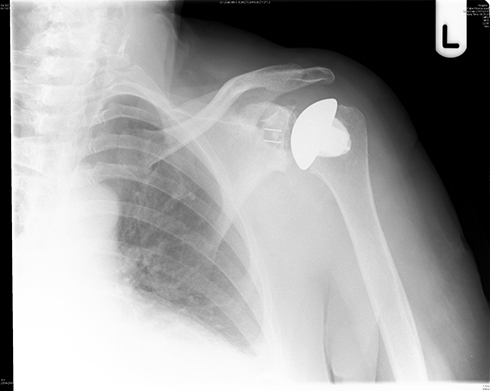 This procedure involves removing the worn out socket and ball bearing surfaces from the shoulder joint and replacing them with synthetic ones. If at all possible we would aim to replace both the socket and ball side of the joint to maximise the pain relief obtained from the procedure. Very occasionally it may not be technically possible to implant an artificial bearing surface on the socket side of the joint; in which case the ball bearing surface alone will be replaced. This is known as a hemi-arthroplasty. Two types of total shoulder replacement are available: “anatomic” and “reverse”. The condition of the rotator cuff tendons within the shoulder determine which of these two types of shoulder replacement will be most appropriate – an equal degree of pain relief can be expected from both. 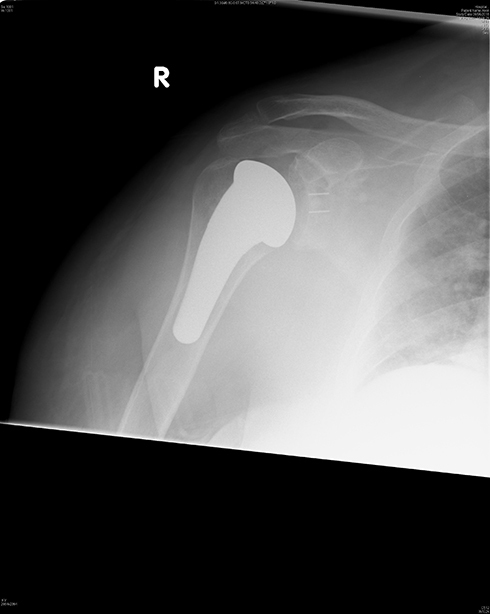 In an anatomic replacement, a plastic socket is cemented in place and a metal ball fixed to the arm bone (humerus), often without the need for cement, using either a “stemless” or “short stem” design. Research shows that if the rotator cuff tendons are not functioning normally, an anatomic replacement plastic socket will tend to show signs of loosening at an earlier-than-acceptable time point following surgery (less than five years). To avoid this scenario occurring, a reverse replacement would be recommended for shoulder arthritis and non-functional rotator cuff tendons. 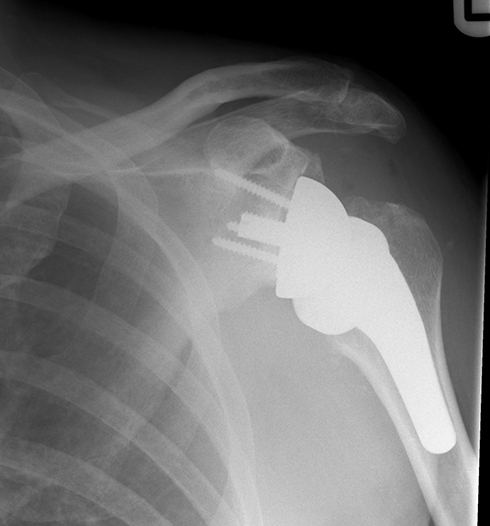 As the name suggests, in a “reverse” total shoulder replacement a metal hemi-sphere is implanted on the socket side of the shoulder joint and a plastic “socket” within a metal stem on the arm bone (humerus) side. This design arrangement of the new prosthetic shoulder joint is able to compensate for the lack of rotator cuff function by recruiting the large deltoid muscle to take on their work; thus avoiding the problem of any early component loosening. Any surgical procedure carries with it some potential risks and we will help you to weigh these against the proposed benefits pre-operatively so you feel able to make a fully informed decision about your care. The risks associated with a general anaesthetic are usually low and will be discussed during your pre-operative assessment, the surgical procedure carries with it a risk of bleeding (very rare to require a blood transfusion), infection, damage to nerves / tendons / blood vessels, stiffness, fracture, dislocation and long term wear and loosening of the components. 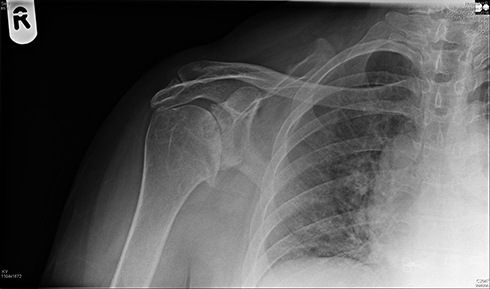 These latter complications would usually only occur 10-15 years following surgery and the need for any potential revision surgery can be anticipated as part of routine out-patient surveillance of your new shoulder replacement. Shoulder replacement surgery is performed under general anaesthetic with a regional anaesthetic block used to provide excellent post-operative pain relief. The patient will usually be admitted to hospital on the day of surgery and often only need to stay for one to two nights following the operation. A sling will be provided for use in the initial four to six weeks following surgery and physiotherapy advice, and future outpatient appointments, will be provided prior to discharge. Most patients find the relief of the arthritis pain to be immediate but it commonly takes three to six months for patients to return to daily activities without restriction. Expect to be unable to drive for a minimum of eight weeks. There will be regular follow-ups in the outpatient clinic following surgery with check X-rays as appropriate.